The Texas Triple Tens presented by Reliable Air resumed racing Sunday morning after making the call to combine the purse from Saturday and Sunday’s electronics race due to low temperatures and dangerous track conditions. Though racing didn’t go as planned, J’s Joint provided racers with delicious plates of food for the Texas Triple Ten’s Racers Appreciation Dinner. Texas Triple Tens Sunday started with 209 entries in electronics and 86 entries in no electronics. No Electronic competition was tough as drivers laid down some great packages Sunday, but ultimately Chad Sandlin was able to claim his second big check of the weekend over Lucas Walker. Sandlin and his S-10 were dialed in and proved to be unstoppable as he was .005 and dead on with a two in the final over Lucas Walker. Walker was also dead on with a two but forfeit the win when he was one thousandth of a second too early leaving the starting line. In the Electronics class Chris Gulitti was sitting on two entries in the semi-final round of Sunday’s Main Event presented by Pro 1 Safety. Though Gulitti lost his first entry to Dillon Bontrager in one race, he was able to claim a victory over Heath Fountain with his other entry. This lead to a rematch between Gulitti and Bontrager with Gulitti claiming the $20,000 big check in the final round of Sunday’s Main Event. One unique prize to go along with the big check at the Texas Triple Tens were the Belts that each driver won thanks to David Bird Jones and Smart Mobile RV Detailing. Each winner wore their belts proud in the winner circle, as this was a pretty cool addition to their wins on Sunday. Smart Mobile RV Detailing offers different wash packages and for more details contact David Bird Jones at birdjones417@gmail.com for more details. Pro 1 Safety came on board to support the racers of the Texas Triple Tens by giving away six $100 Gift Certificates. 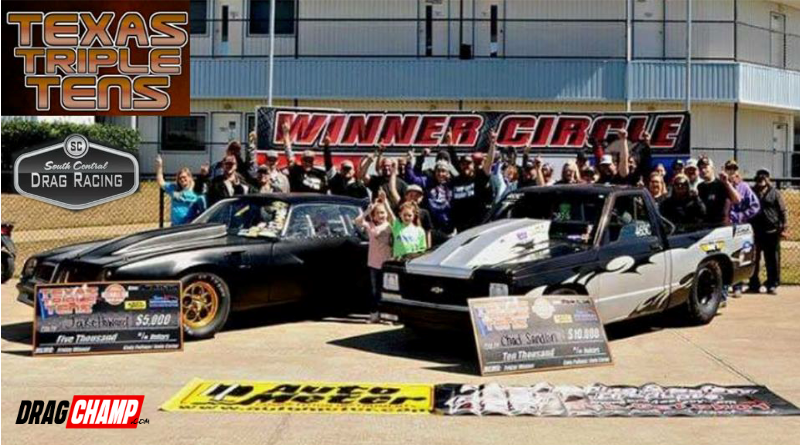 Lucas Walker was able to claim two gift certificates for “Best Burnout” in no electronics and his runner-up finish in no electronics on Sunday. While the “Best Burnout” for electronics gift certificate went to Jared Winger. Other gift certificate recipients throughout the weekend were Dillon Bontrager, Billy Talbot, and Rick Huffman. All certificates are good for purchasing safety belts, jackets, pants, and other great products from Pro 1 Safety. E-Z Paint Best Appearing Car Award The E-Z Paint Best Appearing Car Award went to Daryl Jorey with his beautiful blue GMC truck. A special thanks goes to BME Photography for providing beautiful photos throughout the weekend including winners circle photos.